I'm Maisy Donnington, and tonight I'm going to be your guide to the wonderful world of cheese. You know, cheese is a magical thing. It can say so much about who we are, express so many varied emotions and moods. In spite of our many differences and disagreements, people of all nations and creeds can be brought together thanks to the international language of cheese. But often, selecting just the right kind of cheese can be a nightmare. So many brands! So many flavours! So much to choose from! Well worry not, for I'm here to help you through this intimidating minefield of dairy produce. Just follow my simple advice and you will be able to relax and enjoy your cheese to the full. I first became interested in cheese when I was introduced to it at an early age by my father. I well remember those dark winters long ago, when I would creep into his study late at night. The air would be thick with the heady aroma of cigar smoke, combined with the fusty yet strangely comforting smell of leather from the many sturdily bound volumes that lined his shelves. It was often Father's habit to work late into the night, composing speeches and attending to his correspondence, and he always had a glass of port and a wedge of cheese to see him through the evening. He, of course, would welcome my intrusion as it allowed him a brief respite from his labours, and he would invite me to smell his cheese. 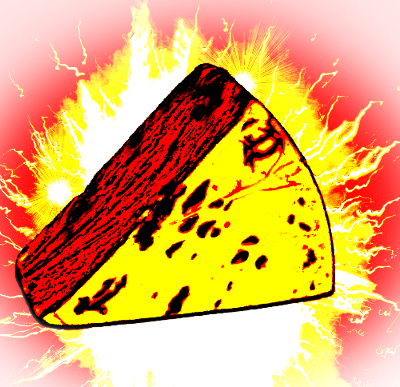 Sometimes it would be Edam, sometimes Brie. On occasion he even ventured a Stilton or a Danish Blue. Those aromas were pungent, alien and dangerously exciting. I remember still the thrill of anticipation before that heady odour hit my nostrils, the satisfaction of correctly guessing a Camembert or Roquefort. That's how I learnt how to not fear the cheese, but to embrace its pungent glory. Later in life, as my long standing interest in cheese became more widely known, many people would actively seek me out to solicit my advice. What is the best time of day to serve Red Leicester, they would ask? Or what is the best sort of cheese to feed to a distressed member of the clergy, they might ponder. I have always tried to respond to these enquiries to the best of my ability, and whilst I may not always have the answers, I hope that the advice I have been able to impart has helped in some small way to allay people's cheese-related anxieties. Below, then, I present a selection of some of the letters I have received over the years, along with my replies. I have endeavoured to include many of the more commonplace questions and queries, in the hope that my advice might also be of some assistance to you, dear reader. I have recently become familiar with a young lady in the Henley area. I would quite like to become familiar with her in a number of other areas also, but I fear rejection. My problem is the young lady in question comes from quite a well-to-do family, whereas I am of limited means. I suspect that the usual methods to a lady's heart - chocolate, flowers and so forth - may not do the trick, and I was thinking of presenting her with some cheese. Sadly I am unable to afford the more exotic Gruyere or Finlandia Swiss, and I was thinking of plying her with some stout Wensleydale instead. Am I being too forward? Please, Ms Donnington - do you think that there's any chance that she might one day succumb to my cheesy advances? Well Ronald, you certainly don't beat around the bush, do you? Never mind the delicate Bries and gentle Camemberts - it's out with the old Wensleydale and straight down to business! Deary me, the young really are so rash. You must learn that the way to a young girl's heart is not through Wensleydale, but through Parmesan. Resting seductively in a satin-lined mahogany presentation case, it cannot fail to make the young lady swoon. My young niece has just given birth to a darling young boy, and I am keen to introduce him to cheese at an early age. I am planning to knit him a shawl out of cheddar, and I was wondering if you might suggest somewhere I might find the appropriate pattern? Stop right there! It is highly irresponsible to give young children clothing made out of cheddar. 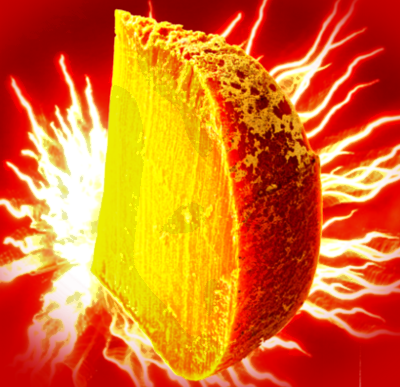 Such a hard, abrasive cheese can chafe the skin and encourage the attention of rodents. It is best to use some sort of soft, low fat cheese spread up until the child is eighteen months old. Thereafter it can happily be weaned onto small booties made of a nice Greek feta. A sweater knitted from mild cheddar should serve the little tyke up to the age of eight, at which point it may be worth considering an anorak fashioned from Stilton. I was wondering what would be the most appropriate type of cheese to serve to grieving relatives at a wake. Nobody I know has died recently, but it's as well to be prepared, isn't it? Quite right Mary! I've always found that a four year old Gorgonzola usually helps them snap out of it. For best results it should be loaded into a rocket launcher and fired at a spot just three inches to the left of the grief-stricken relative's head. Next Saturday I have, on a whim, invited the Lord Mayor of Liverpool around for a barbecue on a patch of rough turf next to my garage. Whilst a barbecue is not traditionally considered a formal affair, I believe that the presence of His Worship necessitates making an extra special effort. Any suggestions? I am reminded of a charity function I attended in Dorking, back in 1976. I was offered - in addition to the regulation vol-au-vents and other sundry nibbles - what appeared to be some variety of processed Cheshire substitute. I was greatly offended by this and made my feelings perfectly clear to the host, before turning sharply on my heel and storming out. I was mindful that this was a philanthropic occasion and that certain culinary cutbacks would have to be made, but nevertheless, the serving of this vile, substandard 'psuedocheese' was absolutely unforgivable. You would do well to remember that even the most informal of occasions presents no excuse for such bad form, and accordingly you should serve His Worship the very finest cheese that your funds will allow. During the course of my business I often have occasion to visit the City, and it has been my habit of late to take several wedges of Double Gloucester along for the journey. These I carry tucked into the waistband of my trousers. However, I have noticed that this often causes concern amongst passers-by, who seem quite disturbed by the sight of cheese protruding from my lower regions. I feel I may have caused myself some embarrassment, can you help? Whilst I'm sure you acted in all innocence, I'm afraid the fact of the matter is that it is generally considered quite vulgar for a gentleman to display his cheese in a public place. Have you considered investing in a small velvet knapsack, in which you can transport your Double Gloucester in comfort and without causing offence? Alternatively, Harrods sell a very smart cheese belt, which can be worn beneath exterior clothing, and has the added advantage of individual compartments, thus allowing for the simultaneous conveyance of several different types of cheese without fear of cross-contamination. So there you have it - just some of the many letters I've received from cheese enthusiasts from around the world. I hope that my advice will assist you in avoiding some of the more obvious cheese-related faux pas. As a final word of warning I would encourage you to remember this: cheese is a wonderful thing, but in the wrong hands it can be deadly. Treat it at all times with respect.